NBA League Pass Broadband delivers live out-of-market NBA basketball to your computer and select Internet connected devices. This year’s version is now available for order. One again their are multiple separate NBA League Pass options. NBA League Pass Broadband Premium gives you access to every team for $139.99 (on time payment), or 5 installment of $44.99. The NBA League Pass Choice Package gives you access to any 5 teams of your choosing for $139.99 (one time price) or 5 installments of $30.99. Note that this offer does not include mobile phones! Both packages offer “up to” 720 HD picture, game stats, picture in picture, mosaic mode, and full season on demand archives. The fine print says that you need “at least” a 3.5 MB/s connection for 720 HD. Additional features include the ability to watch 4 games at one (computer), archived games, highlights, dvr controls, and in-game stats. 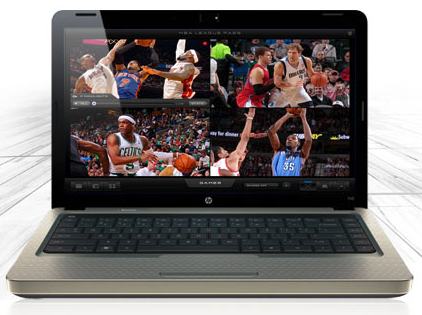 NBA League Pass Broadband allows you to watch on your computer, iPad, and Android Tablet, along with a host of TV connected devices like the Apple TV, Roku, XBox 360, and PS3. XBox owners probably already know this, but watching NBA (or anything for that matter) will require an XBox Gold subscription which will cost you an extra $60 / year or $25 for 3 months. So be sure to factor that into your budget. Although, you can get discount XBox Gold subscription cards on Amazon.com. In past season, NBA League Pass Broadband has been available for a short period at the beginning of the season (usually about a week) as a free preview. NBA League Pass isn’t for everyone. It’s really just for the out-of-market fan, or the fan who just can’t ever get enough NBA basketball. It’s also a nice option for those cord cutters who can’t other see much NBA basketball. Make sure you fully understand the blackout rules before purchasing. Essentially, if an NBA game is available on TV in your area, it will be blacked out in NBA League Pass Broadband. That includes local and national broadcasts. So, every game broadcast on ESPN, TNT, ABC, NBA.TV, or any other local or regional station, will be blacked out in your area. Also, it’s regular season games only. No pre-season. No live playoffs. Archived playoff games, however, will be available.